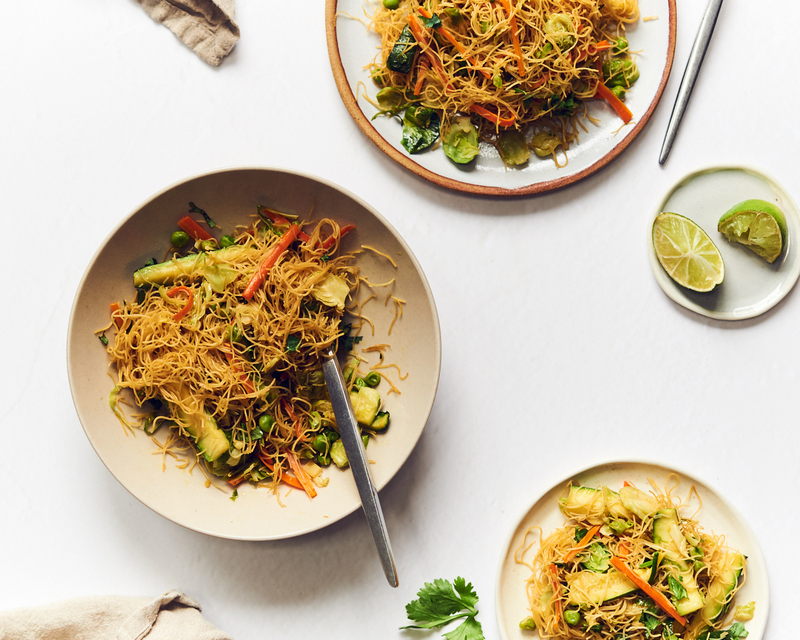 If you like stir fries and rice noodles, you are going to absolutely love this recipe! It’s one that we have prepared for many of our private chef clients and love it so much that we make it at home for ourselves when we need a quick, easy meal that’s super tasty. One of the best things about this recipe is that it’s easy to modify it and omit the rice noodles if you don’t eat grains or are on a low-carb or carb-free diet. We work with many clients who are on paleo or ketogenic style diets or low-carb diets because they find that limiting or avoiding carb intake helps them manage their weight. We also see some clients follow this type of diet when they are going through cancer treatment (although it’s not the only type of diet that our clients with cancer decide to follow). That’s because studies have looked into the connection between sugar and cancer cells and have found that cancer cells grow in the presence of sugar. Some of our clients find that reducing their grain intake also helps reduce their overall inflammation levels, that can help them deal with digestive issues and other inflammatory conditions like eczema. If you are going to replace the rice noodles, you can try using kelp noodles or shirataki noodles. Or, if you prefer using vegetable “noodles” you can use spiralized sweet potato noodles or spiralized zucchini noodles. 1. Prepare the rice noodles by placing them in a bowl of hot water for around 5-10 minutes to soften. If you are making another type of noodle, such as kelp or shirataki, you can drain them out of the package and rinse off. 2. Prepare the veggies and heat some avocado oil in a large pan. 3. Add the garlic for 30 seconds and then add the rest of the vegetables. Saute for around 10-15 minutes, until the veggies are cooked. Remove from the pan and set aside. 4. Heat some more avocado oil in the pan and add the noodles. Saute for a few minutes, adding in the curry powder, tamari (or coconut aminos) and toasted sesame oil, making sure all of the seasoning is evenly distributed. 5. Add the vegetables back into the pan and stir together with the noodles. 6. Top with fresh cilantro and optional lime juice.